When we hear the word “Waltz,” chances are we envision dashing, mustachioed cavaliers whirling crinoline-skirted beauties around a candlelit Viennese ballroom. Violins throb, sabres and jewels flash; the scent of gardenias and the sound of laughter fill the air. We have Johann Strauss Jr. and, of course, Hollywood to thank for that image. 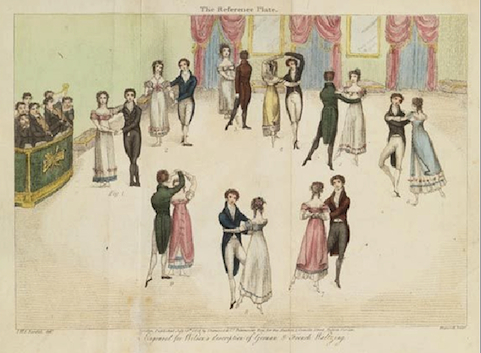 The Waltz, like many later 19th century ballroom dances, had its origins somewhere in central Europe, appearing first in the 1770s as a variation used in cotillions and contredances, then gaining popularity as a dance in its own right in Vienna and Berlin before being exported to Paris and London. 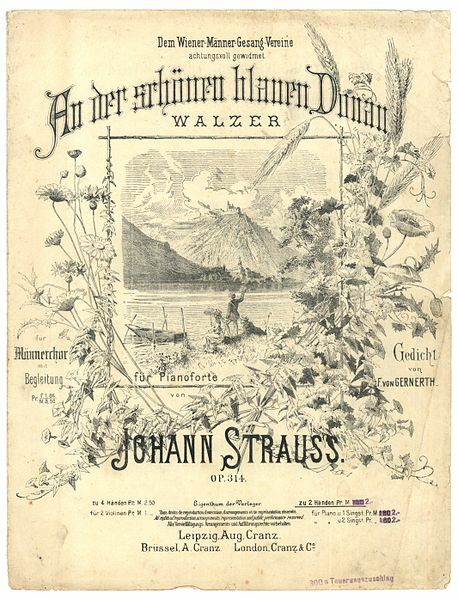 By the time Strauss, “The Waltz King,” introduced his stirringly sentimental composition “The Blue Danube,” in 1867, the Waltz had reigned in European ballrooms for over seventy years. The road from little known dance variation to “Queen of the Ballroom” had been slow, unsteady and beleaguered by opposition. The staples of the 18th century dancing assemblies had been the Minuet and the Country Dance (see the February 19 post, below.) Both comprised strictly regulated movements, allowed only minimal physical contact between dance partners and demanded awareness of not only other dancers, but of the scrutiny of onlookers as well. 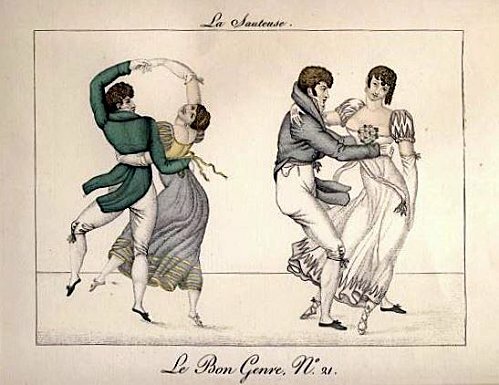 The Waltz, however, was done in close embrace, with partners gazing into each others eyes, isolating each couple in their own private sphere of enjoyment (see illustration below). In this sense, the Waltz was the first of what we would consider our repertoire of modern social ballroom dances. Arms were wrapped about each other, heads were flung from side to side in abandon and legs were intimately intertwined as the pair glided counter- clockwise around the room while rotating clockwise about each other (see illustration, right), like the celestial dance of the earth and the moon as they revolve around the sun. Worried mothers not only complained that their daughters now appeared in the intimate embrace of a man in public, but they feared that the constant voluptuous whirl of the dance would make young girls giddy and prone to lapses of good judgment, claiming that dancing three Waltzes made females as light headed as drinking three glasses of champagne. Rumors even spread of young married women who, “running into the vortex of the waltz with impaired features and fatigued organs,” were seen to fall dead in the arms of their partners! Seen as the product of foreign sensuality and degeneracy, in “Lyttleton’s” eyes, the Waltz had no place in virtuous American ballrooms. 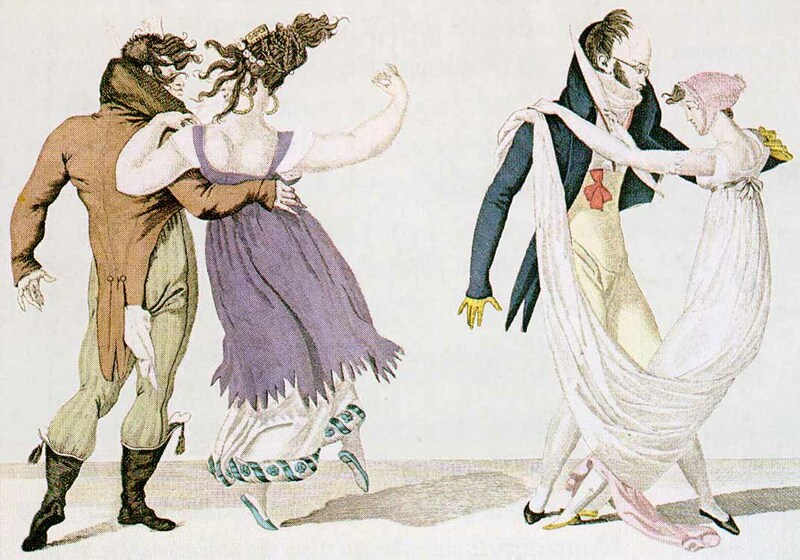 Some feared that the democratization of the French during their revolution led to the democratization –and corruption– of popular dancing there. It would take several years before the Waltz would become an accepted part of genteel social dance in Philadelphia. 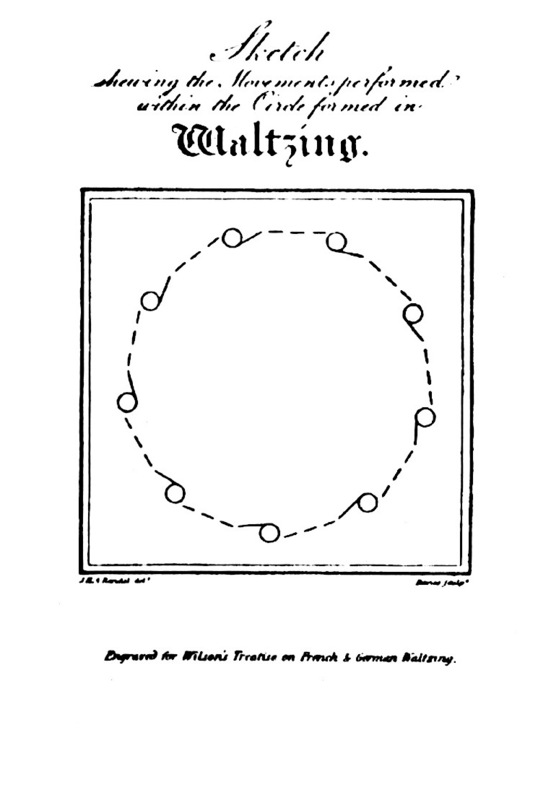 The first treatise on the Waltz to appear in English was Thomas Wilson’s “A Description of the Correct Method of Waltzing, the Truly Fashionable Species of Dancing,” which was published in 1816. Like all dance masters, Wilson tried to regulate the more objectionable parts of the Waltz, strictly describing the dance’s steps using the technical balletic five positions of the feet and warning against all attitudes and movements that were not “graceful and pleasing.” He attributed the bad reputation of waltzing to the fact that “every dance was subject to abuse, and now that waltzing was more prevalent among other than the first classes of society, it was in danger of being less refined, less proper and far less than correct.” He claimed to have published his book, therefore, with the intention “of remedying so great an evil.” The reference plate of acceptable Waltz positions from his treatise, below, certainly shows a far more formal and controlled style than the wild abandon apparent in the French engravings, above, from ten years before, but many more holds and positions than are seen in ballrooms today. Wilson also distinguished between two main types of Waltz: French Waltzing, done high on the toes to slower music and German Waltzing done on a flat foot to faster music. Philadelphia lays claims to many American innovations; the first hospital, fire insurance company, lithographer, steamboat, horticultural society, even American’s first carpet factory. The list may seem endless, but perhaps we can add one more item. In 1793, Thomas Wignell and Alexander Reinagle opened their beautiful New Theatre on Chestnut Street west of 6th Street. The opening season was spoiled by the onset of the Yellow Fever epidemic in the city. Wignell used this unfortunate delay to sail for England to hunt for talent for his theatre. Among the many performers he hired were the accomplished dancer, comedian and character actor, William Bodley Francis, right, and his actress wife. 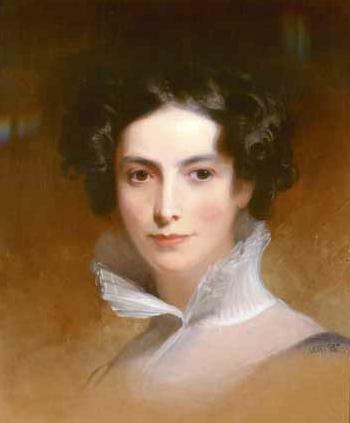 In the fall of 1796, Wignell also hired James Byrne, who had been the ballet master and principal dancer at London’s prestigious Covent Garden, and Byrne’s wife, who was also a dancer. After only a few weeks, Byrne and Francis had formed a partnership and opened a dancing academy at Oeller’s Hotel on Chestnut Street across from the Theatre where they performed; many 18th century Philadelphia stage dancers supplemented their incomes by teaching social dancing classes. (For a description and illustration of Oeller’s, see the February 16th post, below). Philadelphia city directories from the period show the Byrnes and the Francises all sharing a house at 70 N. 8th Street. It is possible that Byrne, having just arrived in Philadelphia from Europe a few weeks before, could have brought the new dance with him. This would mean that Philadelphia ladies were ahead of their Boston and New York sisters in having their senses inflamed and their organs fatigued, and adds another in the long list of firsts for Philadelphia. I wonder if the “German Waltz” the ad refers to is the flat-footed style that Thomas Wilson described in his treatise, a style that would have been more popular before the Waltz was metamorphosed in Paris. Byrne and his wife returned to London a year later, but Mr. Francis made his home here in Philadelphia, teaching and performing at the Chestnut Street Theatre until his death in 1827. He is buried in Christ Church Burial Ground, only a few blocks from the Chestnut Street hotel where he first helped introduce Philadelphia, if not America, to the voluptuous whirl of the Waltz. 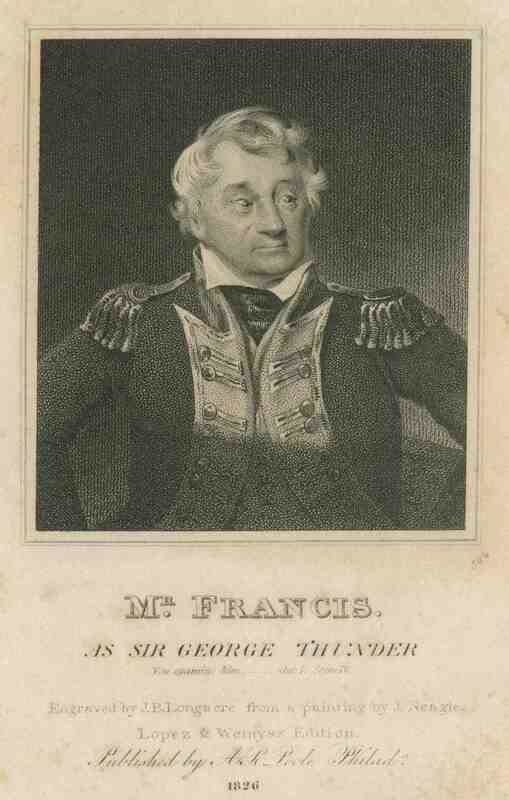 ● Engraving of Mr. Francis after a painting by J. Neagle. The engraver, James Barton Longacre, is best known for designing the Indian Head Cent. This print was published in Philadelphia in 1826, shortly before Francis’ death.